Guest Blogging probably I hope you know what is Guest Blogging exactly as in the word it says it all. Recently Guest Blogging has been on its revolution stage getting viral such that almost all sort of bloggers are using this facility. Wordpress is providing a plugin for Guest Post already for their service users. If you do not know what is Guest Blogging, let me tell you; It is nothing different but you blog in other blogger's blog so that the number of views, traffic goes to their blog and credits goes to you, you get paid too. If you want to do a Guest Post in a blog, you have to request the owner of the blog with your ideas and your information. If they are interested in your ideas, they'll let you do a Guest Post in their blog. Recent surveys on Guest Blogging shows that it is highly responsible for the blog traffic. It is because not only your blog allows Guest Posts but also you guest posting on other blogs. I am writing this post about Guest Blogging to tell you the importance of it and why you should also do Guest Posts often. Say you are blogging for over an year and still you find it hard to get more readers, your PR is still low. That means your blog is not much popular among your niches in the internet world. What Guest Blogging offers you is simple. It helps you gather more traffic to your blog. There are so many popular blog on your niche. Select some of them and prepare a topic(Post) very attractive to read and guest blog on any of the selected blogs. Once you do a Guest Post to a blog, they provide you a credit of an expert in your area along with your blog information, I guarantee you there are chances of your post viewed my thousands of readers a day. Not only they read your post, they read your information, know about your blog. It gives you an exposure to the internet world. You are known to people all over the world as an expert in your niche all through your one Guest Post. Seems Tempting? When you do a guest post for a blog, you'll professionally said to be placed in their business contact's list. Likewise, if your guest post is good and attractive, you'll get many contacts not only to your blog but also personal business contacts. Many people will try to contact you through social medias or though your blog. This increases your business contacts list. Opportunities are getting more community readers to your blog. Increase in your business contacts automatically means the increase in your blog traffic. Guest Blogging is a SEO Technique that gathers you more backlinks. When you guest post a blog, they provide you a backlink to your blog along with your credentials. They also credit you with a name professional(expert) in your niche. Backlink to your blog from a popular blog with high PR like makeuseof, ehow, Kissmetrics etc means your blog is about to get more traffic from it. Precisely, your blog is one step near to being popular. It will increase the traffic to your blog and your frequent readers list. Guest Blogging means to whatever blog you write a guest post, it should stand out to be the one in your masterpiece lists. It will have to be perfect to improve your credibility. It also improves your writing skill, and also your thinking capability. When you do a guest post, you'll get more ideas from your side and also from the blog owner's side. When Ideas combine, there comes Perfection. It will improve your writing potential. Honestly, at the time I got my interest in Blogging, I was not aware of many blogging professionals and their blogs. Whenever I visit a Guest Post in any blog, I look into the blogger's information and visit their blog too most of the times. I find amusing posts on their blog right equals to I become a Subscriber to their blog. 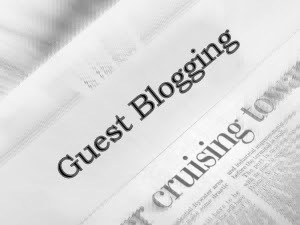 Guest Blogging is a successful technique of gathering traffic to your blog.